There’s nothing like the Grecian sun on your skin to make all those worries float away, and thats just what you’ll get at Danai Beach Resort & Villas. 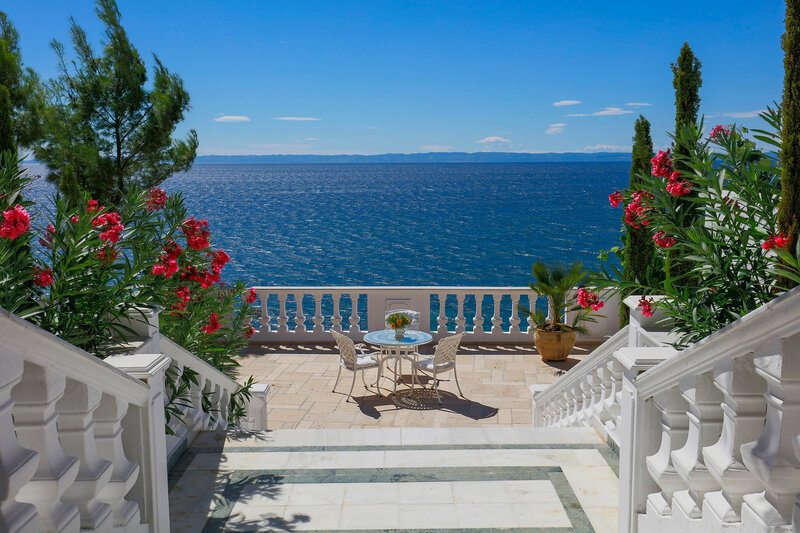 Its a family run property, located on Sithonia, the second peninsula of Halkidiki, Greece, and surrounded by the Aegean sea. 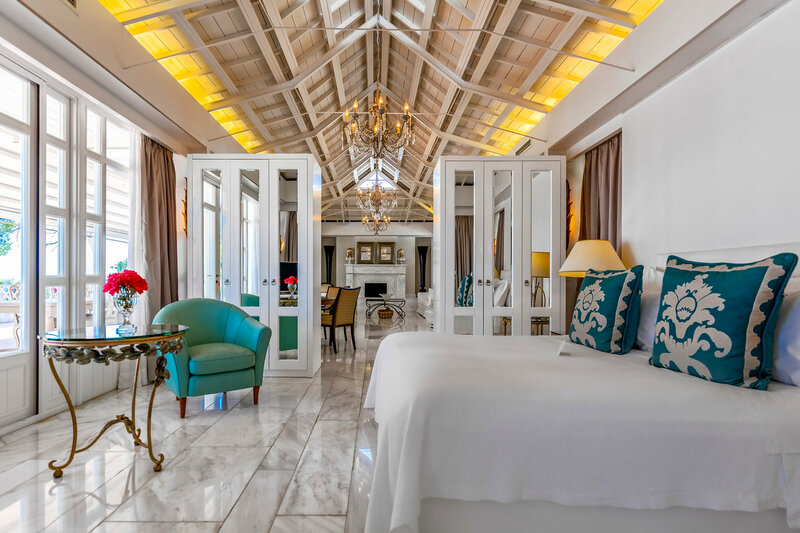 Each of the 64 individually designed suites and villas offers a haven for mind, body and soul. Take one look at the photo below and imagine yourself staring into that azure blue Aegean sea and tell me you don’t forget about your worries. suites, pool suites and villas. 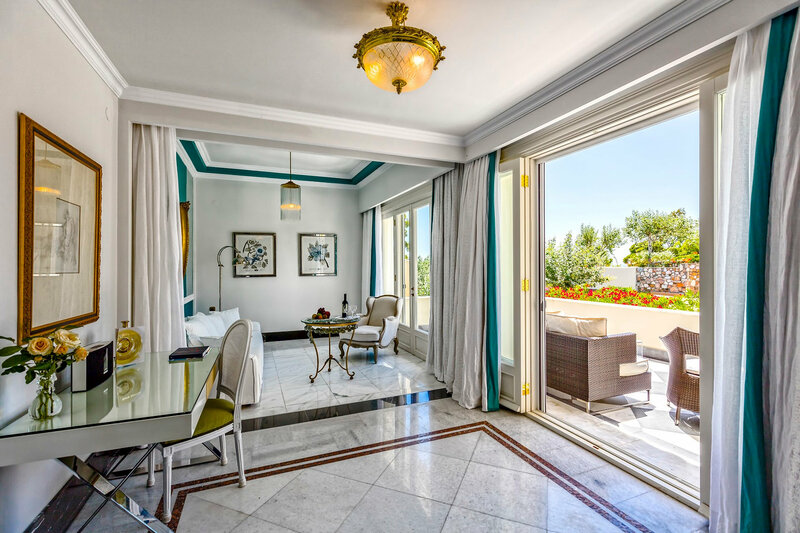 Every room from the junior suites up the pinnacle of luxury with the Green Pearl Villa offers luxurious elegance inspired by the natural environment complemented by sleek design and modern amenities. 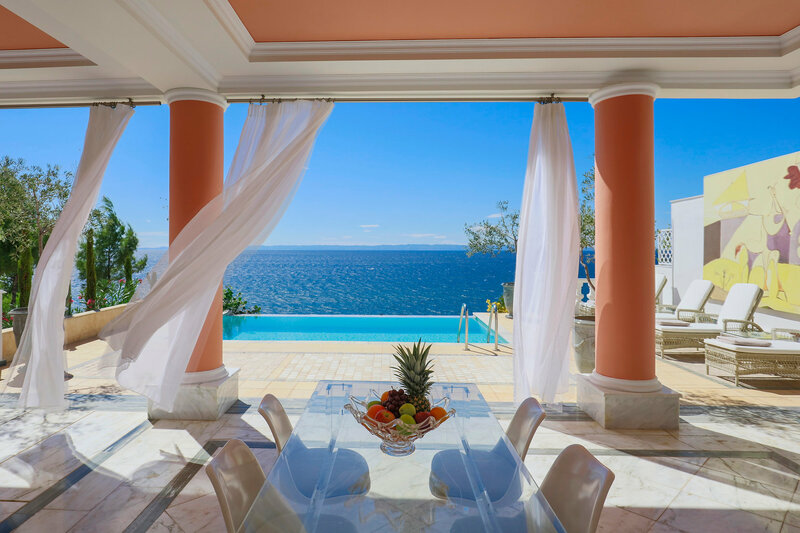 All Pool Suites and Villas come with private pools and stunning sea views. 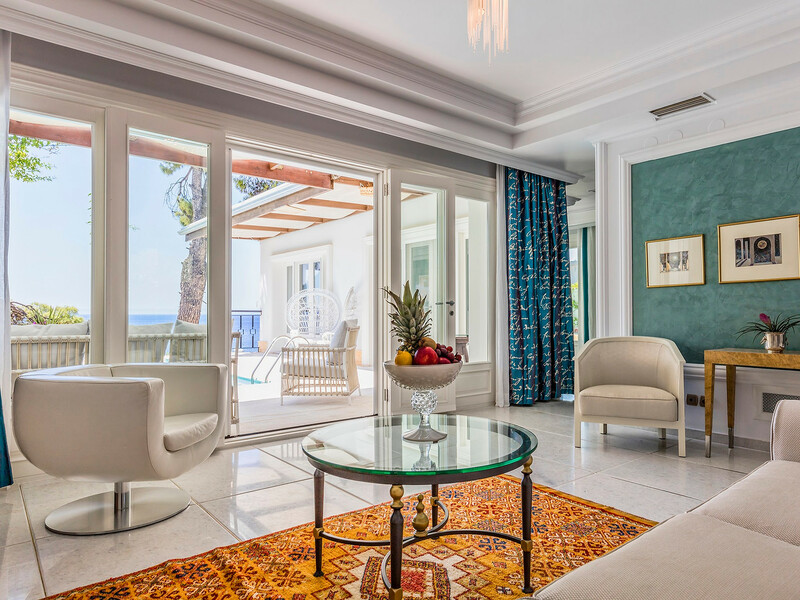 The newest addition to Danai Beach Resort & Villas is the Green Pearl Villa, is a serene space offering two levels of sophistication and elegance. Two en-suite bedrooms are filled with designer furniture, unique artwork, white marble elements and offer breath-taking scenery and views at every turn. 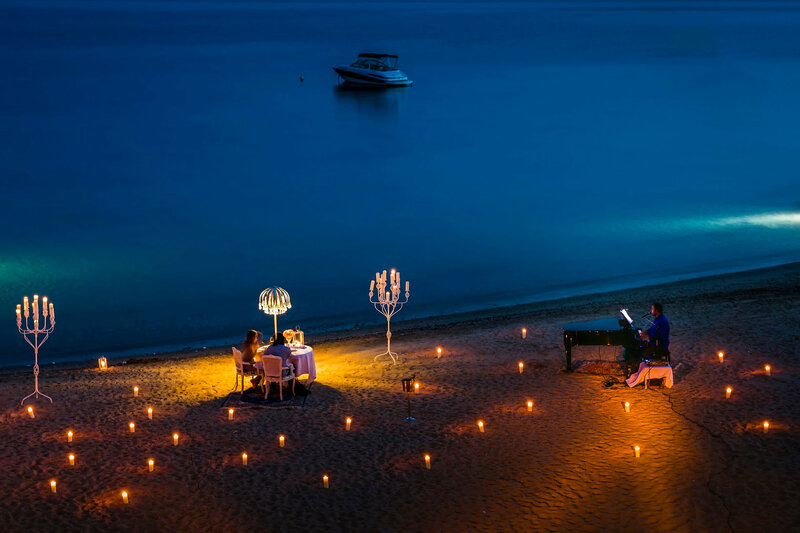 Danai Beach Resort & Villas offers an array of dining options including the outstanding cliff side Squirrel restaurant known throughout Greece, which has received numerous culinary awards including the presitigious “Golden Toques” for its incredible menu. The beach front Sea Horse Grill serves freshly grilled meats and fish, while authentic al fresco Greek restaurant Bachtses showcases traditional local cuisine and Andromeda offers an international menu with modern Mediterranean dishes. The Philosophy Seaside Bar was completely renovated in 2016 and offers a range of unique cocktail creations. Danai is committed to offering incredible high gourmet standards, focusing on organic and carefully produced ingredients, many of which come freshly from the on-site herb and vegetable gardens. Guests can also enjoy this fine cuisine in a private culinary experience in their suite, villa or under the stars on Dania’s private beach or at custom locations in the 40,000 sqm of gardens which make up the resort. Offering something very special for wine connoisseurs the award-winning wine cellar at the property ‘Cave á Vin’ is the largest in Greece, offering an incredible selection of 1700 wines and 20 champagnes from around the world. Not only has the property been awarded ‘Best Wine List’ in Greece but also Sommelier Alexandros Bouzikas was awarded Best Sommelier amongst the Sommeliers within the Greek Association of Sommeliers 2017and will shortly participate for winning the award by L’Association de la Sommellerie Internationale. Danai Beach Resort also hosts an array of culinary events, including Sunday Breakfast Bunch with live classical music along with a range of entertainment throughout the week from classical pianists to live jazz performances. A weekly programme of special events includes traditional Greek speciality evenings, lobster nights and sushi on the beach. The SPA at Danai Beach resort is a wellness sanctuary with holistic therapies, a Cleopatra bath and a range of wonderful wellness activities from yoga and Pilates to specialist weekly retreats. The main focus is on Oriental Holistic Therapies and treatments on offer include Relaxation Massages, Deep Tissue Treatments, Therapeutic Massages as well as Beauty and Cosmetic Treatments. The Fitness pavilion provides a professional tennis court, and multiple pools can be enjoyed including both indoor and outdoor pools. The main pool shaded by tall pine trees, offers aromatic lime towels and refreshments to complete the relaxing environment. There are a range of leisure facilities including yoga, tennis, fitness instructors, painting, cooking classes, bath butler and even extra special dog services for four legged friends. Danai Beach Resort has wonderful activities on hand for the whole family, a dynamic and spacious Kids Club and Crèche allows for adventurous and creative afternoons all under the supervision of qualified, multilingual professionals. A 14-day schedule with daily changing themes offers a Pirate Day with exciting treasure hunts throughout the Resort and authentic face painting to Greek Day with Greek dancing as well as allowing the kids to make Greek dishes, including delicious Tzatziki. Foreign language classes in Greek, English, French or German, dancing classes, painting classes and baby yoga are also available. This April, Pause for Effect has teamed up with Home Farm to launch the first in a series of Pause Weekends designed to help people to reset, reconnect and refresh. Set within 100 acres, only an hour from central London (10mins from Stanmore tube station), Home Farm Glamping is the perfect sanctuary to do this. According to research conducted by Pause for Effect in October 2016, a third of us rate ourselves below 5 out of 10, in terms of our ability to cope with everyday life. Our research also showed that whilst half our respondents still love tech, they find it overwhelming at times, 1 in 5 respondents reported they’d recently ‘broken up’ with tech and social media. When your mac or PC goes into melt down, IT always tells you to ‘turn it on and off again’. To take a short reprieve. A deep breath prior to reconnection. And goddarn it, it inevitably works. The Pause experiences (pauseforeffect.co/homefarm) were set up in response to this feeling of being overwhelmed and provide people with the opportunity to take time away from everyday life, fully reset, and be themselves. Aimée Bryan, Founder of Pause for Effect says: “We won’t be asking for your phones at the farm gate. 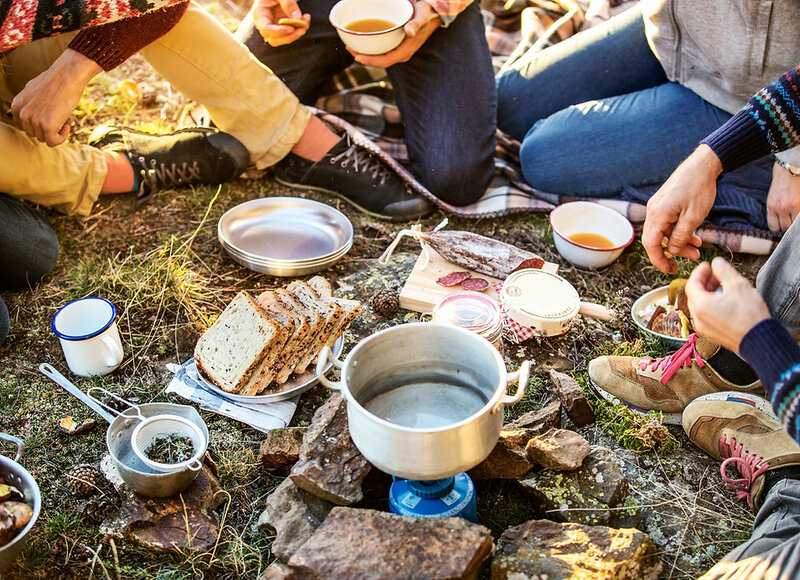 We’ve designed experiences that encourage our guests to reconnect to each other and nature, to be comfortable with being bored, day dreaming and to embrace JOMO – the joy of missing out. Each Pause experience is based around a timetable of physical and creative activities designed to reignite and inspire your passions. Our research showed a direct correlation between those who engage in physical and creative activities and those better able to ‘cope’ with the pressures of every day life. Only real beds and real home cooked fare is on offer, because compromising on how you fuel your body is not an option. Beautiful bell tents and yurts set in a meadow. Pop up restaurants under the stars. Organic food you learn to cook over the campfire. Hampers to help you wander free. It’s all included. Land girl pauses: women only experiences that build practical skills, camaraderie and confidence for life. Think this girl can, and we will. (2nd-4th May and 16th-18th June). For women only, we’ve re-created the opportunity to play ‘land girl’ in order to combat the pressure many women feel to hold it all together and be all things to all people. A great mum, cook, wife, employee, leader, PTA member… but with no time to be you. As a land girl, we give you the freedom to turn your hand to the land. To learn new skills, free up headspace, laugh, fail and grow back into yourself. To walk away more confident in your own capabilities and abilities, and with a better sense of who you are.